My daughter has recently got interested in magic tricks (hiding coins behind ears and rudimentary sleight-of-hand), so I was happy to review ABRACADABRA! 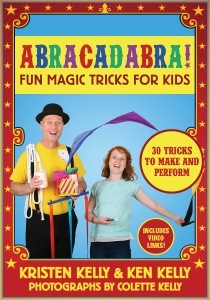 FUN MAGIC TRICKS FOR KIDS by Kristen, Ken, and Colette Kelly. My daughter loved that it was a kid - eleven-year-old magician Kristen and her magician dad, Ken. The step-by-step photographs were very easy to follow, even for her. It took a lot of practice, but it was fun for her to be able to do "real" magic. Not only was it fun for her to be able to do magic, but now she's able to figure out some tricks by watching them. This doesn't really take out the fun of magic shows, it just makes them even more fun as brain teasers! I've found this to be true of myself as an adult as well - even though I know how some tricks are performed, I'm still amazed by the pace and pattern of a magic show, and the ones I haven't seen before really challenge me to figure out what's going on. If you have a budding magician who likes playing tricks on family and friends, check out this book to give him or her new ideas!